Mark is odd. This is why he got into comedy. His physical, colorful style has seen him earn many roles film and TV in Australia including ABCTV's "Being Me." Absurd, edgy and innovative, Mark's multimedia brand of comedy will put you in the mood to tap dance. Mark began his comedy career while completing his Bachelor of Creative Arts at Flinders University. After graduating in 2003 Mark went straight into a number of on screen roles including Australian drama 'Peaches' starring Hugo Weaving and two series for the ABC, "Like It Is" and "Being Me." During this time Mark developed a reputation in Australia for edgy comedy, centered around multimedia and public stunts. Mark also continued to work in children's entertainment, most recently with Mighty Good Productions, ESP Traveling Showman and ventriloquist Lindi Jane. 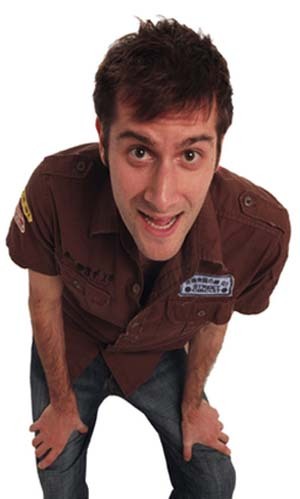 He has performed solo shows in the last three Adelaide Fringe festivals with 'Be My Friend' (2007) 'Danger' (2008) and 'Express'(2009)and performed a reworking of 'Be My Friend' for his debut season at the Melbourne Comedy Festival in 2009. His edgy public stunt, multimedia style is fast making him a talent to keep an eye out for. 'Genius..one of the most hilarious things I've ever seen. 'dB Magazine. "Well thought out and funny without relying on swearing. He's just really clever and has a natural sense of humor"- The Independent Weekly. Mark's career has continued to rise with stints in New York City and his up and coming debut at the Edinburgh Fringe Festival in August 2009.